You can see by the boys' tongues that it was a hot and humid Louisiana day. 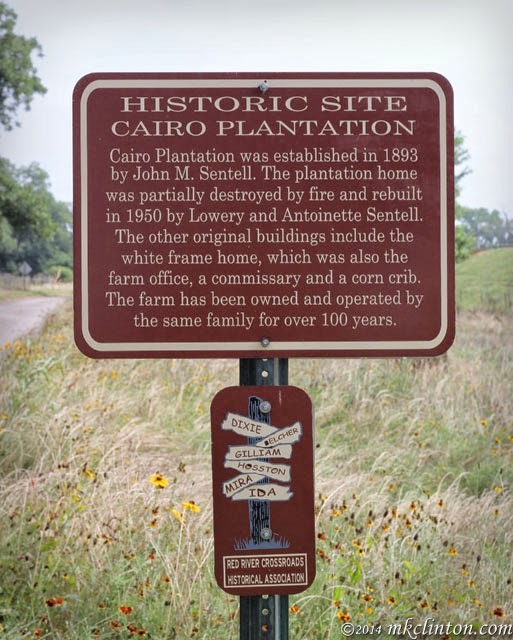 John Sentell established Cairo Plantation in 1893. It has been owned and operated by the same family for over one hundred years. The home was once partially destroyed by a fire. Lowery and Antoinette Sentell rebuilt it in 1950. The current occupants are the John Sloan family. Mr. Sloan has lived on the Cairo Plantation in the big house and a home that was once the plantation office his entire life. He farms cotton, wheat, and sod. His wife is an artist. They are responsible for planting the sunflowers. There are historical markers all along the roads in the area. After we walked the boys through the sunflower trails, we still wanted to do some exploring. The plantation has an area across the street from the home where you can walk around and explore. It is like strolling into the past and you can sense the history in the buildings. There are several rusted pieces of farm equipment in barns or in the yard. 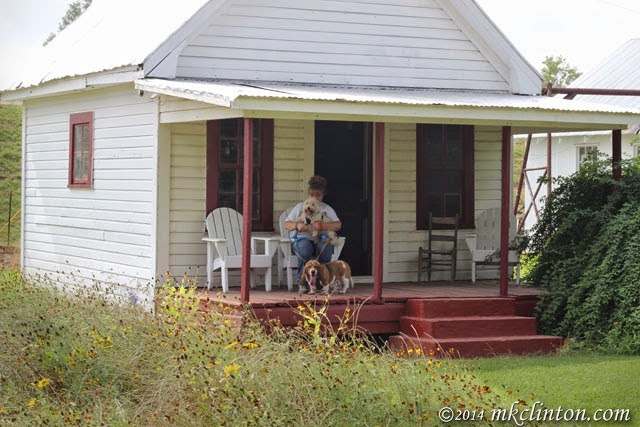 We walked up on the porch of an old white frame home that was an original structure. It has been used as a farm office, commissary, and corncrib. There were several rotten boards on the porch. We avoided those and took a step inside. If you are a fan of antiques, you’d have been in hog heaven. There was an old cash register, stool, farm implements, and more huge holes in the wooden floor. Since there was no room to move around safely inside, we hurriedly back out to the porch. The boys and I would not have enjoyed Louisiana pre-air conditioning life. It was a hot and humid Sunday afternoon, so we piled back into the air-conditioned car and drove further down the plantation's road. 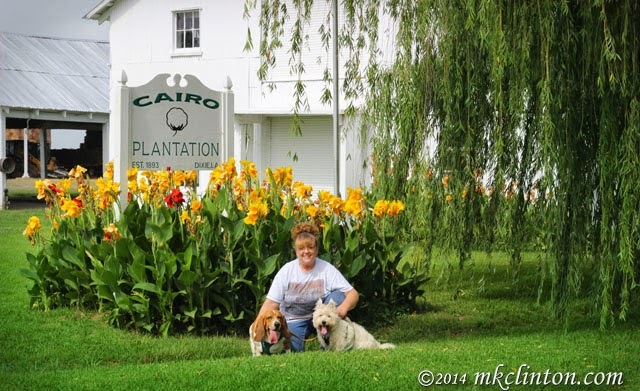 The Cairo Plantation is a beautiful property and a working farm. 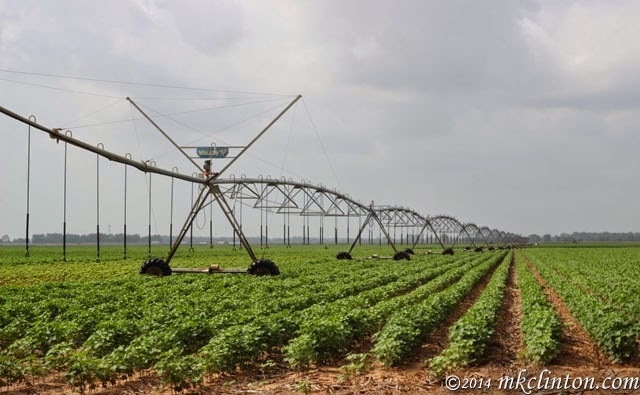 They have irrigation systems that move up and down the crops to keep them watered. I hope that we will get to visit again and take photos in these cotton fields when they turn white. The sunflowers, scenery, and crops are definitely worth the trip to Dixie. Thanks Whitley. You'd have loved chasing through them. Looks like a beautiful place. I wouldn't mind spending a day there either. Thanks for sharing and have a lovely weekend. What a gorgeous place to explore!! I have only been to New Orleans / Louisiana once in my life. I seriously thought I would DIE!!! My body (due to illness) does not do well in humidity...or heat. What a time I had!! I absolutely loved visiting New Orleans / Bourbon Street for the day, but I sure was darting in and out of air conditioned bars and shops every couple of minutes!! I guess you get used to it if you live there!! I love the sunflowers in this post!! Happy SS!! New Orleans is a terrific place to visit. I have lived here forever and can assure you that I have never, ever, ever, ever, gotten used to the heat and humidity! BOL!! Wow what a cool place and loved the first pic. Have a super Saturday. Speedy,, you'd have had a blast in all of those flowers. Trust me friends, living in Europe, they don't have a/c either and it could get pretty toasty at times. I love those sunflower fields! Enjoy the a/c after your adventure. I'm glad that you like it. We are going to try to find some dog friendly places to share with y'all that are around our area. All those sunflowers reminded me of Tuscany - how could you not be happy when you see all those bright yellow heads bobbing in the breeze. It was a very happy field of flowers. Everyone was smiling as they walked the paths. Thank you for the lovely tour, I just love that first photo. It is one of my favorites also. Thanks for visiting us. We have to take it in pieces. The dogs can't even stay out very long without their tongues hanging to the ground. OMD…… you got da best pic ever of the land of OZ. And you even have a black birdie lookin on. Dat is a money shot/calendar shot for sure. LOVE, LOVE, LOVE it. Awww, thanks Ranger! We thought it looked just like the yellow brick road, except it was dirt. That crow was flying and landing all over the flowers.! Sunflowers are on of our favorites, what great photos you got! Thank you! We took a lot of sunflowers shots. They were just so pretty. That is so cool, I love to visit places rich with history, and it's such a bonus if dogs are allowed! 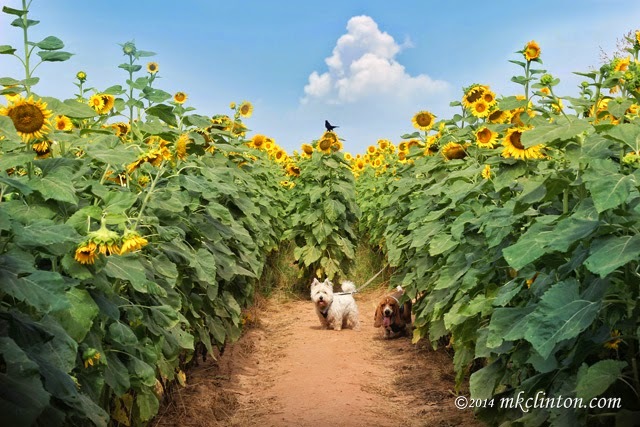 They must have had a ball walking through those rows of Sunflowers! They really enjoyed themselves. We have a lot of history in our area. I'll try to bring more to share with you. Those sunflowers make for some beautiful scenery! They were gorgeous and there was 60 acres of them! Sunflowers make such a gorgeous cash crop. We love sunflowers and our humans eat the seeds! Well, she has a lovely place! Where in Louisiana did you travel? It is hot everywhere in our state! LOL! The sunflower photo looks like something out of the Wizard of Oz!!! Love it! I wish they'd have had a talking and singing scarecrow! Thanks Jenna! You would have enjoyed the old buildings filled with treasures. I love those sunflowers! They're beautiful! They let everyone cut as many as they wanted too! We had a lovely arrangement. What an amazing place! Those sunflowers are beautiful, and what a rich history Cairo Plantation has. It is amazing. There is a vast amount of land that makes up the plantation and farm. Looks gorgeous! I love sunflowers! Wondering if that was a sunflower maze? We have corn mazes up here right in the fall, do they do the same thing down there with sunflowers?